In this video we look at the admin interface for working with menus and menu items in Drupal 8. 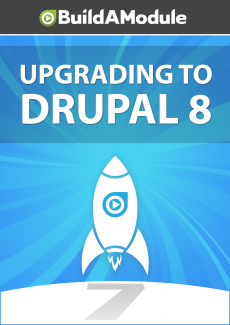 Not a lot of big changes since Drupal 7, but there's still some improvements. Let's go back to the homepage. So I'm going to click back to site in Drupal 8 and then I'm going to click X on the overlay in Drupal 7. I'm going to hide the menu in Drupal 8 as well, let's take a look at the interface changes for managing menu items. So here on the my account logout, I'm going to click the edit icon and click edit menu. To get to that same place in Drupal 7 we'll need to click structure and then menus, and then edit menu on the user menu. One major change is that the list links and edit menu interfaces have been merged. So if we go back in Drupal 7 you can see that next to the user menu there's the list links, edit menu and add link items. If we click the list links we'll see the items that we see here at the bottom of this page, and if we go back and click it at menu, we'd see the options that we'd see at the top of this page. So the interface has been simplified a bit.